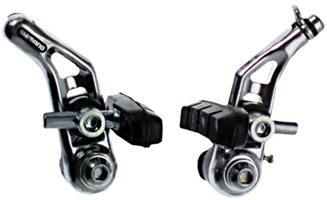 All of the brakes shown on this page are compatible with traditional brake levers, both "road" and short travel "mountain" style. 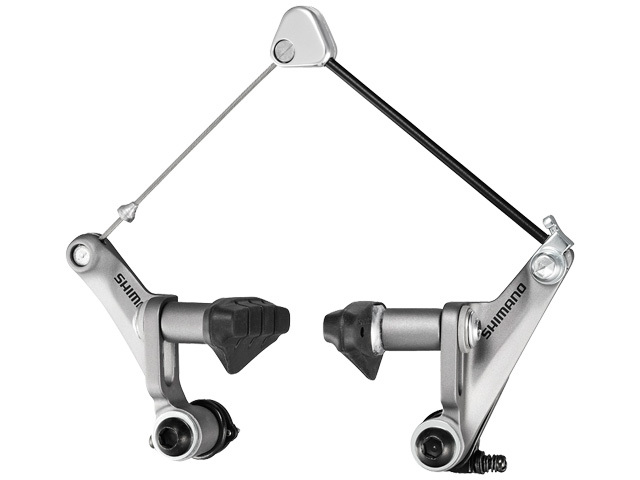 They do not work with levers intended for "direct pull" type brakes, such as Shimano V-Brakes. 105 level cyclocross cantilevers from Shimano. Compatible with STI/Ergo brake/shifters. Wide set alloy arms with unique brake shoes that are mounted on the end of an extended post with two included options for length, excellent mud clearance, one piece road style all conditions pad, highly adjustable angle and height, quick release Y-link, dual spring tension adjustment, fit front or rear. Sold individually, buy two for one bike. A good, basic, low-profile cantilever. For best results, replace the stock brake shoes with Kool Stop "Mountain" shoes.